Indian regulators have yet to figure out an appropriate regulatory framework for civilian UAV use. Is India equipped to regulate civilian drones? In an alarming breach of security procedures, drones were reported to be flying in areas of high security, including in the vicinity of New Delhi’s Indira Gandhi International Airport and the area a few meters from the presidential residence, Rashtrapati Bhawan. These incidents capture the urgent need to address the vacuum of regulatory measures regarding the operation of Unmanned Aerial Vehicles (UAVs) in the civilian sector in India. In October 2014, the Directorate General of Civil Aviation (DGCA) placed a blanket ban on the use of drones for non-military purposes. However, the irony lies in the number of UAVs that were both imported as well as flown across the country since the ban; this fact made it quite clear that the DGCA was unable to enforce the ban on UAVs. Consequently, the DGCA acknowledged the need for a regulatory framework for such flights to avoid catastrophic consequences. DGCA eventually issued a set of draft guidelines in April 2016, aiming to regulate the rapidly growing industry. Although these guidelines are meant to regulate the usage of drones in various civilian use scenarios, their current form seems to come with a nearsighted approach and is ignorant of the rapid advancements being made in the field. The draft, on which DGCA has invited comment, seems to be a knee jerk reaction to the sector’s regulatory framework. In its current state, the framework is heavily restrictive on drone operators, and unclear on protocols for authorities. First, the primary objective of these guidelines is to prevent UAVs from interfering the operations of manned aircraft. This is a realistic objective that needs to be achieved in the short term. However, the guidelines do not take into consideration a scenario wherein UAVs start impeding one another’s operations, the likelihood of which is real in the long term. Within the next four years, there will be an estimated 700 drones in the air for every commercial aircraft across the world. The current guidelines simply do not address the consequences of a rise in the number of drones in operation–a trend that has been predicted by various organizations. One of the guidelines that appears to be severely restrictive is that micro and mini drones cannot be flown more than 500 meters away from the operator. 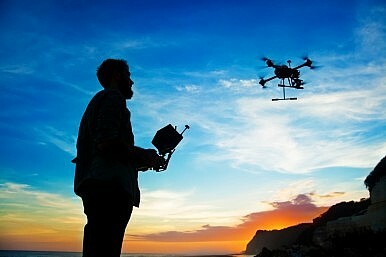 This limits two of the most common uses of micro and mini drones – aerial photography and product delivery. Operators will find it virtually impossible to carry out photography-related operations when said guidelines come into effect. Any operator using mini drones for delivery, like what Amazon has proposed doing in the United States, simply cannot implement this mechanism in India due to this new regulatory framework. Moreover, there is a severe lack of training and equipment for Air Traffic Control (ATC) systems to accommodate drones in Indian airspace. A possible way to make this work — but still unexplored — is support from the Armed Forces, who have been successfully operating and developing drones for several years now. The army has the technology to ensure the safe operation of vast numbers of UAVs and it is still quite unclear why the DGCA is unwilling to accept technical support from the Armed Forces, both in technology and personnel training. The most glaring absence in the current guidelines probably is the lack of regulations governing quality control of these UAVs. The guidelines do not lay out rules regarding the import of UAVs, which are now a dutiable good in India. Given the fact that a majority of commercial UAVs that are used today are imported rather than developed locally, it is essential to have a certain degree of quality control during each import to ensure public safety. The lack of quality control leaves UAVs vulnerable to major malfunctions, which can cause serious damage to life and property. Another key issue that needs to be addressed by quality control guidelines is to reduce the susceptibility of UAVs to malicious hacking or interference. While the DGCA has imposed legal liability on drone operators, there is still a lack of awareness among law enforcement agencies on investigating cases of drone misuse. Even in the case of the drone that was flown near the President’s residence, authorities reacted without a clear agenda, which illustrates the obvious the lack of a response protocol. Protocol needs to be established among law enforcement agencies, and dialogue between the DGCA and state police departments is important as well. In conclusion, while the DGCA guidelines put an end to the blanket ban on drones for civilian use and have attempted to fill the vacuum in related policies, multiple challenges still exist in addition to new questions that need to be addressed. Not only does the DGCA need to take current scenarios into consideration, it also has to understand the pace at which civilian UAV use is growing. It needs to ensure that the policy and regulatory framework covers possible scenarios in the coming years. In a field where technology is advancing at an exponential rate, a short-sighted regulatory approach is unlikely to be effective. Rahul Krishna is a research intern at the Observer Research Foundation.